STOCKTON, CALIFORNIA (May 12, 2016) - Stockton 99 Speedway will host its 68th season of racing competition when the historic quarter-mile fires up the lights on Saturday night May 14th. The speedway will heavily emphasize a revived local program in 2016 with the Noceti Group presenting a full season of points racing. The N. Wilson Way oval will welcome the return of Late Models and Grand American Modifieds for points racing along with Pure Stocks and the touring California Mini Cups. The Super Stock division has been re-branded as Stockton Late Models, incorporating many different engines under one unified rules package. Stockton Late Models will compete in ten races over the course of the season. Grand American Modifieds were the largest division at Stockton 99 throughout the 90s and 2000s and return after a one-year hiatus for eight points races. Bombers will also race this season for a points championship and will race a total of ten times this season starting with Saturday's races. The California Mini Cups have their first of five races on Saturday night and feature the youngest drivers at Stockton. With many Mini Cup drivers moving up the ladder, the division has seen a clean slate with all but two or three drivers new to the division. Of the new drivers, most are second and third generation relatives of the Stockton Modified and Late Model competitors. Special events at Stockton 99 Speedway this year include the three race Tri-Holiday Series on May 28th (Memorial Day weekend), July 2nd for the Firecracker 100, and September 3rd (Labor Day weekend). 100 lap Pacific Challenge Series Super Late Model features headline all three nights. The fastest cars to ever hit the quarter-mile, King of the Wing Sprint Cars return on August 6th along with mighty BCRA Midgets. A variety of vintage classes will compete to thrill the crowd as well. Local track championships will be decided all summer long leading up to the season finale on September 17th. The races on Saturday May 14th kick off three big weeks for the Noceti Group and Stockton racing, with May 21st seeing the King of the West Sprint Cars at the Stockton Dirt Track, before the Pacific Challenge Series at Stockton 99 Speedway on May 28th. On May 14th, grandstands will open at 5 p.m. with racing at 6 p.m. Tickets are $15 for adults, $10 for juniors agres 11-15, Seniors 65+, and active military, while kids 10 and under are free. A family pass for two adults and two juniors is $40. Pit passes are $45. A test and tune session kicks off activity on Friday night for the competitors to get ready for Saturday's races. ALL AMERICAN SPEEDWAY. 1/4 MILE. ROSEVILLE, CA. www.allamericanspeedway.com SATURDAY, MAY 14TH. The All American will be presenting their five traditional racing divisions this Saturday night. Providing the jump to your feet action will be the the speedway's Street Stock, Bomber, Pro 4 Modified, F 4 divisions along with an appearance by the Legends of the Pacific. The gates will open at 4pm with the racing beginning at 6pm. General admission tickets, age 16 to 59, are only $10. Tickets for senior fans, age 60 plus, and juniors, are 6 to 15, are $7. Children age 5 and under will be admitted free. The All American Speedway also offers a budget friendly family pack, priced at $35, that admits two adults and three juniors. IRWINDALE EVENT CENTER. 1/2 & 1/3 MILE. IRWINDALE, CA. www.irwindalespeedway.com SATURDAY, MAY 14TH. The IEC will be rolling out the NASCAR Whelen All American Series this Saturday. This fully loaded program will put the racing spotlight on the Siedner's Collision Centers Irwindale Race Trucks, the Pick Your Part Late Models, Legend Cars, Mini Stocks and the RACECAR Factory Spec Late Models. The spectator gates will open at 4pm with the green flag falling at 7pm. Adult tickets are $10 if ordered pre sale. Otherwise, tickets at the gate on Saturday race day are $15. The pre sale tickets can be obtained via online or by visiting the speedway office. Children's tickets are $5. But wait there's more, On Thursday night, May 12th, the back half of the IEC's 1/2 mile oval will be transformed into a 1/8 mile drag strip and become the home of NHRA Thursday Night Thunder. This program proclaims the all important message race the strip and not the streets and is open to all vehicles including street legal cars. The gates will open at 4pm with the racing getting the green light from 5 to 10pm. Entry fee to race all night is $20. General admission tickets are $10, $5 for kids age 6 to 12 with kids 5 and under admitted free. But wait there's still more. While the drag racing is running on the back half of the IEC on Thursday night, the front half of the main oval will be transformed into the home of Formula Drift who will host the IEC's Thursday Night Drift program. The slide ways action will run from 5 to 9pm. Entry fees for drivers is $75 and $10 for spectators. LAS VEGAS MOTOR SPEEDWAY BULLRING. 3/8 MILE. LAS VEGAS, NV. www.lvms/bullring. SATURDAY, MAY 14TH. There's no question that the city of Las Vegas is loaded with special promotions that attracts the attention of visiting tourists. That concept is currently being used by the Las Vegas Motor Speedway who, once again, has presented another impressive marketing idea for this Saturday night. It's Gaming Industry Night at the Bullring. All gaming industry and hotel property employees will be admitted free, with valid ID, to enjoy an evening of racing and will be allowed to bring family members, up to four people, free of charge. The Bullring has scheduled another one of their great shows for this evening featuring the NASCAR Super Late Models who will run twin 35 lap main events. Also on the racing agenda will be the Grand American Modifieds, Bombers, USLCI Legends also running twin mains, the Bandoleros, Thunder Cars and the Skid Plates. The spectator gates will open at 5pm followed by qualifying at 515pm and racing at 7pm. By the way, a special Las Vegas style promotion includes $8 general admission ticket prices. The track is also the home of $2 hot dogs and Coca Cola products and $3 Budweisers. SPEEDWAY WILLOW SPRINGS. 1/4 MILE. ROSAMOND, CA. www.thespeedwaywillowsprings.com SATURDAY, MAY 14TH. This quarter mile paved oval is going to light up the Saturday night lights with racing from eight different divisions. The on track action will be provided by their Elite, Hobby Stock, Mini Stock, Street Stock, Skid Plate and So Cal Enduro divisions. Plus, there's going to be special guest appearances from the Mini Dwarfs and the So Cal Motorized Bicycles. The racing will start at 6pm. Admission is a $10 wrist band, at the main gate, with kids eight and under admitted free. These wrist bands are good for all racing at the Willow Springs' 600 plus acre complex on both Saturday and Sunday. In the case of this weekend, there's going to be exciting sports car action on the Willow Springs' 2.5 and 1.6 mile road courses for the fans to enjoy all day long. 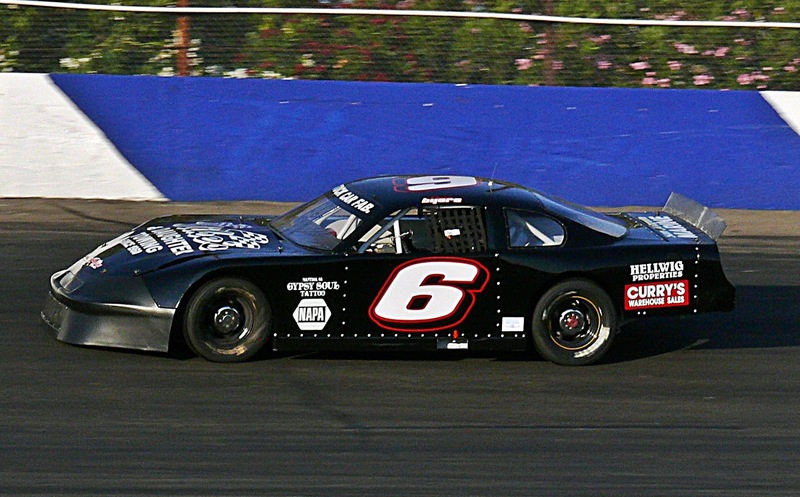 Then later in the evening you can take the short ride to the Speedway Willow Springs for some great stock car action. STOCKTON 99 SPEEDWAY. 1/4 MILE. STOCKTON, CA. www.stocktonspeedway.com SATURDAY, MAY 14TH. Stockton will be treating their fans to an old school racing line up this Saturday night featuring their Stockton Late Models, Bombers, Mini Cup and Grand American Modifieds. The spectator gates will open at 5pm with the green flag falling on the racing at 6pm. The Stockton weekend will begin with a Friday night open test and tune session for all racing divisions, from 4 to 7pm. Pit pass entry fees for race teams and spectators are $40. General admission tickets for adults, age 16 to 59, are $15. Tickets for Juniors, age 11 to 15, and seniors, age 60 plus, are priced at $10. Kids age 10 and under will be admitted free. It's going to be Saturday night lights and the roar of engines from eight different racing classes when Speedway Willow Springs drops the green flag on round 3 of their 2016 season. Providing the on track action will be the speedway's Elite, Hobby Stock, Mini Stock, Street Stock, Skid Plate and So Cal Enduro divisions. Plus, there will be a special guest appearance from the Mini Dwarfs and Motorized Bikes. 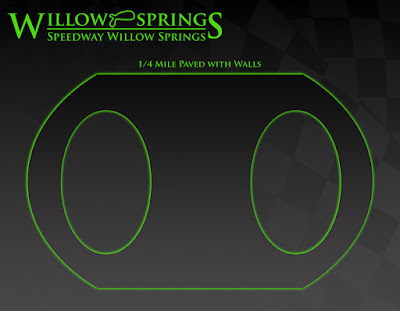 The quarter mile asphalt oval is located within the massive Willow Springs International Raceway complex in Rosamond. With improvements in the community's over night weather forecasts, the speedway will launch their night time race schedule beginning this Saturday night. Green flag time will be 6pm. The Hooper's Rear End Service Elite Division is a unique concept created by the speedway management that allows super late models, late models, modifieds and trucks to race together under the auspices of a single rule book. David Brandon, the winner of last month's main event, is currently on top of the championship points standings and has a 14 point advantage over Rosamond's Alex Anderson, who won the division's season opener back in March. Brandon's points lead is primarily based on his excellent job of collecting bonus points. Speedway Willow Springs employs the use of a unique points system that awards a bonus in the areas of qualifying, heat race finishes and passing points. That's how there's a 14 points gap between two drivers who are main event winners. Driver Johnny Troesch has been the hot shoe in the Wayne & Dave's Automotive Hobby Stock division and leads the championship points based on two, consecutive, main event wins. However, Brandon Fisk is only four points out of first and will be looking for his first feature win Saturday night and take over the top spot in the standings. Also of interest here is a close battle for third in the standings where drivers Michael Williams and Corey Carter are separated by a single point. The Platinum Loan and Jewelry Street Stock's current championship profile is a case of a young, but experienced, driver versus a true veteran who is young at heart. Tony Forfa IV, the winner of the division's round two main event in April, goes into Saturday night with a four point advantage over 71 year old Bruce Secord who won the season opener following a very exciting final lap battle with Forfa. Secord has proven that age in nothing more than a number to be listed on an official document and has become very popular with the Speedway Willow Springs fans. Expect to see more excitement this Saturday night when these two drivers line up for their main event. The Lucas Oil Mini Stocks has raised the question who can beat the #68 Ford? In the round one season opener, team owner John Dunlap made easy work of winning the main event. When it was time to run last month's round two, Dunlap put speedway veteran Bobby Dezarov behind the wheel who parked the car in victory lane for the second race in a row. Going into this Saturday night, Dezarov leads the division's points standings with a four point advantage over Greg Didoha. Also on the Speedway Willow Springs racing agenda will be the very popular The Tire Store Skid Plate cars. With their rear tires replaced with flat metal plates welded to the wheel hubs, this division creates a very unique and fun form of racing. With the speedway switching to their night time format this Saturday night, those metal plates are going to create a shower of multi colored sparks. Brady Mertz and Daniel Chadwick have been the big main event winners so far. Mertz leads the current points standings with a five point advantage over Jon Carter. Without question, the So Cal Enduro Racers has emerged as one of the most popular racing divisions at the speedway and that is based on the high quality of their shows which are often 50 lap features and, in the case of their April event, sometimes 100 laps. Making their feature races even more interesting are the presence of two large tractor tires that placed just outside of the speedway's two straightaways. When the field comes off of turns four or two, they crank their steering wheels to the left and drive around the large tires. That makes the racing line entering turns one and three most interesting. Another aspect to this racing division is the relatively low cost of building and maintaining these enduro cars. The division is largely comprised of sport compact vehicles which can be constructed for around $1,000. The competition in this series can get quite fierce. Going into Saturday night's race, Nate Van Deventer leads the points standings. However, that lead is only a single point over Jake Basham. Driver's Pete Chilbes, Randy Hannah and Michael Walters are lined up third through fifth in the standings. The points separation between the top five drivers is a mere seven points. Danny Quinn, the creator and promoter of this series, has done an excellent job of putting this program together, including securing sponsorships. The So Cal Enduro Racers' race this Saturday night will be sponsored by Swift NAPA Auto Parts and their four locations in Ridgecrest, Mojave, Tehachapi and Lake Isabella along with DRC Pump Systems. By the way, Quinn placed a very interesting post on the series' Facebook page, back on April 27th, that read as follows: "rumor has it that La Policia, Willow's most famous mini van, will be running the next enduro on May 14th. You won't want to miss that." Making a special guest appearance at Speedway Willow Springs will be the Mini Dwarfs. These tiny race cars are popular at race track all over the country and are driven by youngsters often referred to by promoters as the future stars of tomorrow. The racing is usually ran in two classes: drivers 5 to 8 years old and age group 9 to 13. When these youngsters climb out of these tiny cars for a victory lane interview it turns into a major ooh and ahh moments from the fans. The body width of these cars are 42 inches with an open wheel base of 57.5 inches. The weight of the cars are 300 and 325 pounds for the two respective classes. The Honda GX 200 or the Honda GX 160 are the engines of choice for the series. Also making a special guest appearance will be So Cal Motor Bicycle Racing. This highly unique form of racing features standard bikes, from small BMX to larger, standard size, equipped with small gas tanks and engines that range from 50cc to 160cc engines. They are the only racing group of its kind in the entire southwest. They frequently visit the Willow Springs International Raceway to race on the facility's kart track and have graciously agreed to present an exhibition race on the quarter mile oval Saturday night. 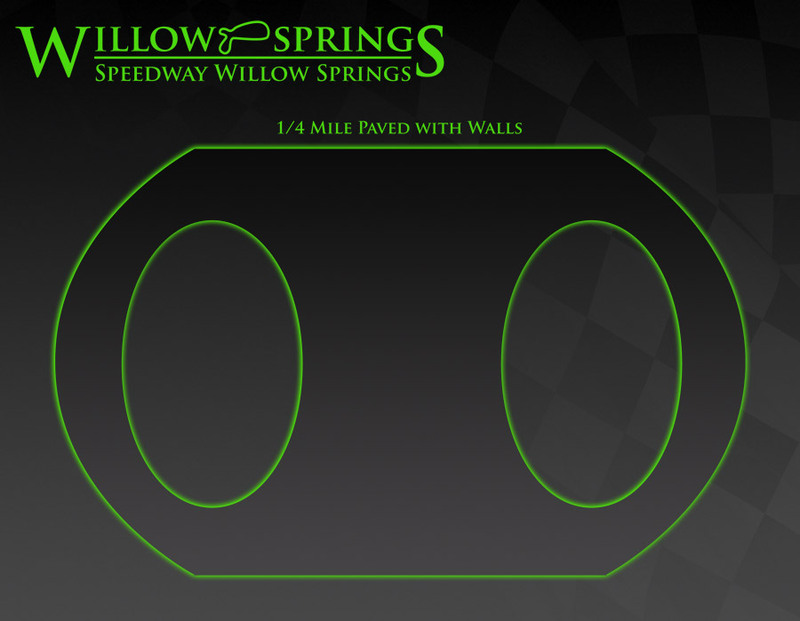 By the way, fans can visit the speedway's website, www.thespeedwayatwillowsprings.com, and see a selection of videos to get an idea of how exciting this form of racing is. For the nominal fee of $10, fans will receive a wrist band at the front gate that will allows them to take in all of this short track racing action. Children 8 years old and under are admitted. But, wait, there's more. Those wrist bands will allow the fans to visit the other tracks within the complex, on both Saturday and Sunday, to watch the racing there. In the case of this weekend, you can take in some sports car action, provided by the Porsche Owner's Club, at Big Willow, the massive 2.5 mile, 9 turn, road course. There's even more weekend action to see at the Streets of Willow Springs, a 1.6 mile road course, where the sports cars from the famed Speed Ventures Auto Track Day will be racing. That's two days of racing for the price of a $10 wrist band. It's also one of the many why Willow Springs International Raceway is regarded as being one of the most fan friendly racing complexes in the country. Racing at the Speedway Willow Springs is powered by a highly potent, and much appreciated, group of sponsors that includes: A To Z Signs, Abadak, Adams Metalizing & Grinding, Angel's Touch Towing, Benz Sanitation, Deist Safety, Dezarov's Mobile Auto Service, Dominguez Mexican Restaurant, 51 Fifty Energy Drink, Frank's Radios, High Desert Cellars, Hooper's Rear End Service, KGG Electric, K&N Performance Filters, Linny White's Race Shop, Lucas Oil Products INC, Misfit Motorsports, Pinnacle Peak Steakhouse-San Dimas & Colton, Platinum Loan & Jewelry-Lancaster, Scramblez, Street Customs, Studio Equipment Rentals, 10,000 RPM, The Tire Store and Wayne & Dave's Automotive. Opening night at Redwood Acres Raceway on April 30th proved to be a very interesting evening of racing on the 3/8-mile paved oval. The battle for the track championship in all six divisions still has a long way to go. Those at the top are looking to add to their early advantage while others hope to recover from woes suffered in the first race of 2016. Steve Paiment currently leads the California State & Federal Employee Credit Union roadrunner standings. The division veteran holds a five point advantage over second place, Tyler Peach. Bethany Rapp and Jennifer Murrell are tied for third while Richard Standcliff is fifth. Standcliff is division rookie and won opening night’s main event in the roadrunners. The Fortuna Wheel & Brake bomber division standings are currently being led by Tyler Avelar. His advantage is four points over James Moore thanks to his main event victory. Ryan Ahrens is seven points behind Avelar in third while Matt Simon and Kim Sorrels round out the top five, ten and twelve points in arrears to Avelar. Jarrett Mayo was dominant in the Humboldt Hydroponics mini stock division on April 30th. His advantage over Gary Klinetobe is four points. Eugene Palmer sits third in the standings and is only eight points behind Mayo. Division rookie, Daniel Buell is fourth 11 points behind Mayo while Brett Murrell is fifth and 12 points off Mayo’s lead. After winning the first Thunder Roadster feature, division point leader, Tommy Payne will look to add another victory while padding his lead for the track championship. Payne has a six point lead over Donnie Brown in the standings. Aaron Byers and Ronnie O’Neill are tied for third and are seven points behind Payne. Chris Sarvinski had a tough first night but is still in the fight as he is fifth in the standings and only 10 points behind Payne. Due to the rest of the field having issues on opening night, Brent Mack has a substantial lead in the new Legend division standings. Mack leads Anissa Curtice by 33 markers. Brad Curtice is 41 points behind while M’Kinzy Uselton is 43 points off Mack’s lead. The Mid City Motor World late model point standings are currently being led by veteran driver, Mic Moulton. Second place is locked between opening night feature winner, Jedd Ambrosini and west coast racing legend, Jim Walker both of whom are three points behind Moulton. Another tie rounds out the top five drivers in the division standings as Marty Walsh and Kenny Demello are eight points behind Moulton. Racing returns to Redwood Acres Raceway in this Saturday May 14th for Pepsi Night at the Acres. All six local divisions will be in action for what should be another thrilling night of action on the pavement. Grandstands open at 5:00PM with racing beginning at 6:30PM. For more information, visit Redwood Acres Raceway’s official website, www.racingtheacres.com. UKIAH, CALIFORNIA (May 8, 2016) - 2012 Pacific Challenge Series presented by PenneyLawyers.com champion Jeremy Doss won his 17th career win, and fifth straight at Ukiah, taking Sunday's 75 lap feature at Ukiah Speedway. Doss took over the lead on lap five and never looked back in the non-stop 16 minute feature. The race was delayed to Mother's Day Sunday after rain washed out Saturday's racing activities. Doss' win also gives him the points lead by two points over his teammate Jeff Bischofberger after three of 13 races have been held in 2016. The American Racer Tires Dash for a set of tires on Saturday night was canceled due to wet weather and not held, so the starting lineup was set based on an inversion. Sunoco Fuels Fast Time qualifier Mike Beeler pulled a four inversion which put Matthew Wendt and Doss on the front row. Wendt led the opening four laps with Doss on his rear bumper before Wendt jumped into the turn four wall coming to complete lap four, to end his night early. Wendt escaped to the pits with right front damage and the race stayed green with Doss assuming the lead. Doss lead by over a second at multiple times throughout the long run before Beeler would continually reel him in as they danced in traffic. Tracy Bolin suffered a broken rear end in Saturday practice and maintained a narrow fourth place run over JR Courage and Chris Scribner throughout the event. Bischofberger overcame a broken axle in the 10 minute last practice session on Sunday to run third throughout the entire feature. Upperlake's Jimmy Stillman used the leaders as a pick to overhaul Lakeport's Jeremy Hopkins for seventh past halfway in one of the stronger battles in the race. Doss started slipping with a loose condition off of turn two and Beeler closed within a car length over the last five laps of the feature. Doss held on for a .483 second win over Beeler, Bischofberger, Bolin, and Courage. Beeler's run from fourth to second made him the Penney Racing Supply Hard Charger. The Pacific Challenge Series continues its 2016 season with the first round of the Tri-Holiday Series at Stockton 99 Speedway on May 28th. TUCSON, ARIZ. (May 7, 2016) – Ryan Partridge put an end to Todd Gilliland’s three-race win streak in the NASCAR K&N Pro Series West Saturday night at Arizona’s Tucson Speedway. The 27-year-old from Rancho Cucamonga, California, held off a charging Gilliland on the Green-White-Checkered attempt to cruise to his second series victory after leading 127 laps. In a similar fashion to his first career win at Colorado National Speedway last season, Partridge earned the Coors Light Pole Award earlier in the day before celebrating in the winner’s circle that night. Gilliland, who leads the K&N Pro Series West standings as well as the Sunoco Rookie of the Year points, settled for second. 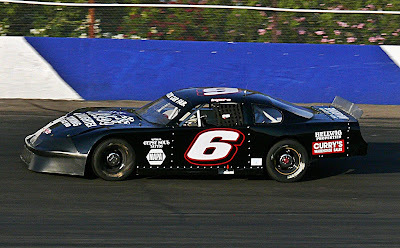 The 17-year-old from Sherrills Ford, North Carolina, headed into Tucson on a three race win streak after collecting victories at last year’s season finale at Arizona’s Phoenix International Raceway, California’s Irwindale Speedway in this year’s season opener and most recently, at California’s Kern County Raceway Park. Chris Eggleston, Gilliland’s Bill McAnally Racing teammate, finished third followed by Partridge’s Sunrise Ford Racing teammate Cole Rouse and Julia Landauer. Matt Levin, Riley Herbst, Blaine Perkins, last year’s race winner Noah Gragson and Ron Norman completed the top 10. The race was slowed twice by cautions, including the halfway break. Gilliland maintains a four-point lead over Ryan Partridge. While Chris Eggleston, Cole Rouse and Riley Herbst round out the top five in points. The NAPA Auto Parts WildCat 150 will air on NBCSN on Thursday, May 12 at 6:00 p.m. ET. 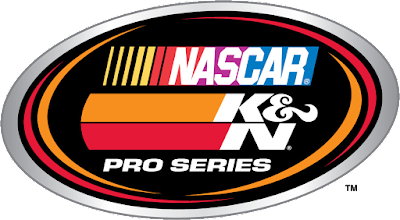 The NASCAR K&N Pro Series West will be back in action May 21 with the Sunrise Ford 150 at California’s Orange Show Speedway. 1. (1) Ryan Partridge, Rancho Cucamonga, Calif., Ford, 156 laps, 64.483 mph. 2. (4) Todd Gilliland, Sherrills Ford, N.C., Toyota, 156. 3. (5) Chris Eggleston, Erie, Colo., Toyota, 156. 4. (2) Cole Rouse, Fort Smith, Ark., Ford, 156. 5. (12) Julia Landauer, New York, N.Y., Toyota, 156. 6. (6) Matt Levin, Tucson, Ariz., Ford, 156. 7. (8) Riley Herbst, Las Vegas, Nev., Toyota, 156. 8. (9) Blaine Perkins, Bakersfield, Calif., Chevrolet, 156. 9. (3) Noah Gragson, Las Vegas, NV, Ford, 155, engine. 10. (10) Ron Norman, Tucson, Ariz., Ford, 153. 11. (14) Stafford Smith, Eagle, Idaho., Ford, 153. 12. (13) Christian Celaya, Caborca, Mexico, Ford, 152. 13. (11) John Wood, Eagle, ID, Chevrolet, 152. 14. 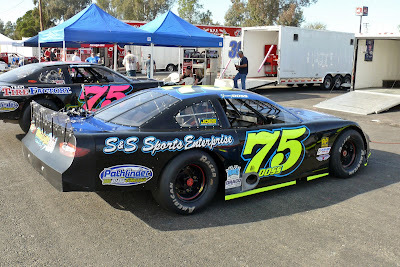 (15) Rich DeLong III, Santa Clarita, Calif., Chevrolet, 150. 15. (16) Jesse Iwuji, Dallas, Texas, Chevrolet, 146. 16. (7) Gracin Raz, Lake Oswego, Ore., Ford, 72, engine. Caution Flags: 2 for 17 laps. Lap Leaders: R. Partridge 1-10; M. Levin 11-38; R. Partridge 39-153; T. Gilliland 154; R. Partridge 155-156. Standings: 1. T. Gilliland, 138; 2. R. Partridge, 134; 3. C. Eggleston, 122; 4. C. Rouse, 116; 5. R. Herbst, 115; 6. N. Gragson, 111; 7. J. Landauer, 109; 8. R. Norman, 98; 9. G. Raz, 97; 10. M. Levin, 91.